Unlike the Apple ecosystem, the Android world is not as simple as a new hardware device and new software version being released each year. In fact it is a trivial exercise to name ten different manufacturers making Android hardware. Unfortunately each of these manufacturers is responsible for providing software updates and after sale support. This is where the issue of fragmentation enters the conversation. Many of the manufacturers release the hardware with the latest, or perhaps one generation old software, then do a very poor job of providing the latest operating system for that older hardware. This leads to countless different hardware variations, running many different versions of the Android operating system. 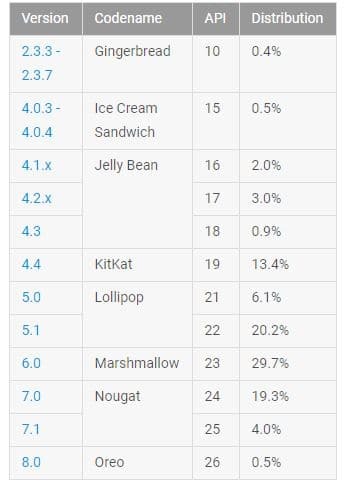 This is most clearly exhibited by Google’s own statistics on current devices and the Android operating system versions they are running (see table). Each generation or yearly release is given a name starting with the letter of the release. This letter increments each year, and the name is always a tasty dessert! Oreo is the most recent release (2017), with each lower number representing one year older release. With there being one named OS version each year, the above diagram makes it clear that the largest number of devices are using a version of Android that was released in 2015 (Marshmallow). By extension, that also indicates that only 25% of Android users are using OS versions released in the past two years. As a point of interest, the latest version of Android (Oreo) was released on August 21, 2017. To this point it can only be found on 0.5% of Android devices, with many of them being Google’s own Pixel branded devices. The Zwift head office will have to decide for their developers what level of the Android OS they require to accomplish their goals. Each iteration of the OS brings with it new features and functionality that they can leverage in designing their platform. If they rely on the latest technology and focus on the latest versions of Android, then they will be developing for a very small audience. However if they aim for older versions of the OS, then they target a larger market share but are faced with the reality of older hardware potentially not being powerful enough to display the platform with high enough frame rates or graphic fidelity. Outside of software fragmentation, hardware developers also create their own nightmares for software development. Each device manufacturer has multiple CPU choices, different graphics subsystems, varying amounts of memory (both storage and RAM) and vastly different screen sizes. Android devices range from sub $50 budget devices to $1000 premium devices with exquisite design and high power processing. Each device also has subtle differences in the hardware, such as different Bluetooth radios, or even the inclusion of ANT+ radios. This will add to the support challenge for Zwift. A recent development in the Apple world may challenge the idea that high end Android devices are “still generally 1.5 years behind in performance from iPhones“. Apple has recently admitted to intentionally slowing devices that are only a couple of years old. This may level the playing field for older devices. It is also not logical to compare a $750 (or higher) iPhone to Android hardware that is on the lower end of the price spectrum. As a developer, the choice has to be made to target a specific Android version as well as the base specifications for hardware performance. Since approximately 80% of phones sold internationally run Android, the shear volume of potential customers is mind blowing. As someone who likes the price/performance ratio available in the Android ecosystem, I am patiently waiting for Zwift on Android. There are numerous hardware choices that could work extremely well for Zwift, with many more being released each year. Chances are the release of Zwift for Android will be the great “excuse” I’ve been waiting for to upgrade my five year old Android tablet! NextWhat are Your Goals for 2018? Dr. Nick Green is a 44 year old Canadian living in Northern Ontario where snow hits the ground in November and stays until until April. 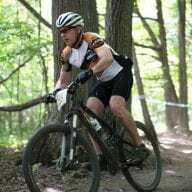 In the summer he splits his time between a road bike and a mountain bike, with several endurance mountain bike events spread over the season. Nick, thanks for the Android coverage and hope you’re staying warm (enough). Trying to do the same here in Calgary. Assuming graphics power is the greatest challenge, what do you think about an Android version simply being a playable version of the Mobile Link app? You could see the 2D map, interact with other users, etc., just not be in the immersive visual environment (which I acknowledge is one of Zwift’s biggest draws). At home, I have a Windows desktop which runs Zwift well, but say I’m on the road or at the gym, I’d definitely use a de-featured version. Particularly for the running module, it’d be cool to have my Android phone if nothing else let me accumulate mileage running around Watopia. Would folks use a basic non-graphic version (understanding that there would still be Bluetooth challenges etc to make it work universally well)? Ryan, this actually sounds like a great idea. I think by itself, a nongraphical version would be a bad choice. However, as a complimentary option to a full version it would be great. An interesting insight, thanks. It makes perfect sense when you think about it – really quite challenging. At the moment I’d just be happy for a reliably working Mobile Link on my Android phone! The frequent failure to recognise a ride in progress or to drop out and fail to re-initialise is a tad frustrating. Mind you the iPhone isn’t much more reliable for this, though, in my experience, it does seem a bit better at least. Generally has me reaching for the wireless keyboard and mouse which are strategically close now as a result. Agree, app is not very reliable. I used to be able to leave the app and come back, and sometimes it would reconnect, but that hasn’t worked lately. What usually works is doing a Force Stop on the app then reopening. This is a pain, but my wireless keyboard’s range isn’t great so it’s worth it for me. Better for Zwift just to improve the app reliability though! Other issues can arise. When I first gt the Kickr, I could not connect to it with the Wahoo app using a GS5. An older S4 was fine. Went back and forth with Wahoo support, and they gave up. Then verizon released an update for a variety of things, and it fixed the BT problem with the S5. On a PC, they have to deal with different video hardware, with different OpenGL versions. So none of the issues you talk about will be new to them. The Windows laptop I use is actually a bit under spec, but the frame rate is still acceptable, so I go with it. My thoughts exactly Eric. Why should developing an Android version pose a different task than creating a Windows version? Furthermore, looking at Android statistics in general doesn’t really make any sense. Those stats will include every basic Android phone in the humongous Asian market – of which only a very very very small fraction MIGHT have ever heard of Zwift. This doesn’t seem to be a problem with other app developers. Just a load of pathetic excuses that apply just as much to PC as it does to Android, and PC’s are working all just fine if they have the correct spec. You release the app for the required Android spec and done is done – unless, of course, you have a contract with Apple to withhold the Android release and make excuses for not putting it out on Android. Just smells too much of BS for my liking. An Android device running 6.0.1 is well up to spec to run Zwift. Please stop the BS. Yes, from a software perspective 6.0.1 should be able to run the Zwift code, but that doesn’t mean that the individual hardware will. I agree that they need to pick a minimum spec, and run with it. Either the user has the required hardware / software – or they don’t. If they don’t, then they need to spend some money or use a different platform. Basic math on Androids 80% market share means if you develop for 6.0 you can reach 40% of smartphone users worldwide. iOS only reached 18% of the market, about the same as the number of android 7.0+ users. While it will be great to be on android, it would make so much more sense to go down the line of coding for X-box one and or PS4, X-box runs on a slimmed down version of windows 10. These machines are purpose built graphics machines ideally suited to running zwift and would be a similar cost to Apple TV but with far more processing power and frame rate capabilities. Both the IOS and Android platforms will always be of limited potential compared to what could be done on the games machines. As a user, yes, you’d almost certainly get far better GFX performance from an XBox or PS4 than a high end Android device. So even a small fraction of the Android base (about 4%) gives you better reach than XBox 360 and PS4 combined. Goes over a lot better with investors. I understand the direction of Android on the tablet. I do not understand using the phone. Too small screen to play. The advantage of Xbox and Playstation with a large screen connected. The disadvantage is that Xbox and Playstation do not have ANT + or bluetooth with low voltage. THIS does not include ZWIFT consoles. Play, as if that is the big draw of Zwift in the first place. The key to what makes Zwift interesting is having your avatar and the virtual environment while on a stationary bike or treadmill. Whatever keeps people going while on one of these things is a big positive. So, a small screen that you have in a gym beats being limited to being at home, where you have a computer plus using Zwift Companion on a phone/tablet. For home use, a tablet running Companion is fine. Greg, Yes Android has a massive base, but for zwift the base isn’t IOS, Android, PC or any other platform. Its base is enthusiastic cyclists that it can get immersed in its environment and those that are prepared to purchase a smart trainer. To bring people in and keep them there its, and to do that you need big screens and high res graphics, Tablets will never cut it for that. Unless zwift are banking on every gym bike and treadmill being controllable and hoping everyone will zwift in the Gym. For most regular users it will be a dedicated set up. That’s where the games consoles come in. Cheaper and better performing than any laptop or tablet with only high end games PCs getting close but at 5-10x the price. Plus think of all the ready rendered backgrounds in those formats. Should be an easy win for zwift. Zwift absorbs the processor too much due to its appearance. There are many games that have better graphics and much smaller requirements. The coding should be improved. It will be very interesting to see how they roll it out. I think the biggest issue will be the graphics chipsets, perhaps it will be rolled out on the basis of which GPU that the Phones and Tablets have. Google have Project Fi, which rolled out with Oreo, to help device hardware interact with OS Software, so future Zwift runnable devices may be more widespread. They could just start developing from API 24 (Nougat 7.1). About 21% of all smart phones run API 24 or higher, while only about 12% of all phones run iOS. Not so shure about the 1.5 year thingy you mensioned. Phones like the razer phone or google pixel 2 will have no problem keeping up with the newest iPhone or maybe run it even better.